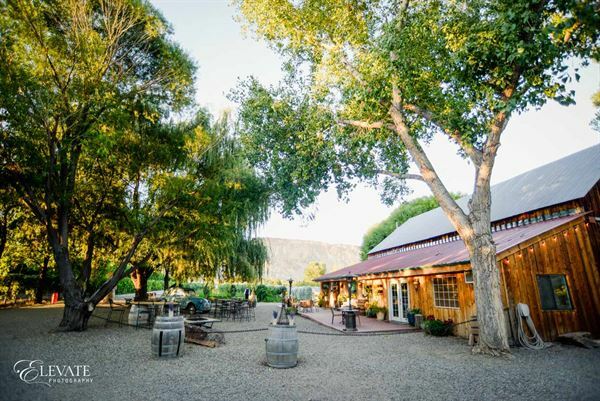 Set against the beautiful landscape of the scenic Colorado wine country, Amy’s Courtyard in Palisade offers a charming and hospitable location for any of life’s special events. Amy’s Courtyard, named after the owner John Barbier’s daughter, is a picturesque property that combines the dramatic vistas of Mt. Garfield with the lush allure of surrounding wine vineyards. There is a beautiful pond, elegant gazebo, homey barn, and a lavish yard. The wonderful climate in Palisade allows you to enjoy warm sunny days and cool evenings that can make any event enjoyable when combined with the natural beauty of Amy’s Courtyard. Whether you are having a casual or formal event, Amy’s Courtyard can accommodate you and your guests comfortably. Events such as wine dinners, buffets, plated or family-style dining, and wine and cheese tasting are common and the focus is always quality service. Amy’s Courtyard specializes in catered events and can accommodate up to 150 guests. Additional services include: set up and clean up, linens and tableware, and menus designed to fit your budget. If you’re looking for a gracious ambiance, fine food and wine, and traditional European-style hospitality, Amy’s Courtyard is the perfect place to have your special event. Includes: • 30 x 40 Hexagon Tent • Chairs & Tables • Use of Bridal Suite • Parking for 65 vehicles • Use of pond for photos A $1,000 Non-Refundable Deposit is required to reserve the date. A $500 Refundable Damage Deposit is also required. A minimum of $450.00 in wine shall be purchased from Maison La Belle Vie, Inc in order to use the venue. Food & Beverage • You are welcome to bring your own keg of beer along with your own cups, you will be responsible for both. • The Maison La Belle Vie Winery can provide wine and champagne. • No other alcoholic drinks are permitted in our grounds, that includes hard liquor and outside wines. • Outside caterers are welcomed but need to be licensed. We have a list of preferred vendors that we know do a great job, just ask. • We also have wine with your personal label, ask us about it if you are interested. • Please remember, the venue should be left the way you found it, otherwise there may be additional charges. Please see attached PDF for more information. Includes: • 30 x 40 Hexagon Tent • Chairs & Tables • Use of Bridal Suite • Parking for 65 vehicles • Use of pond for photos A $1,000 Non-Refundable Deposit is required to reserve the date. A $500 Refundable Damage Deposit is also required. A minimum of $500.00 in wine shall be purchased from Maison La Belle Vie, Inc in order to use the venue. Food & Beverage • You are welcome to bring your own keg of beer along with your own cups, you will be responsible for both. • The Maison La Belle Vie Winery can provide wine and champagne. • No other alcoholic drinks are permitted in our grounds, that includes hard liquor and outside wines. • Outside caterers are welcomed but need to be licensed. We have a list of preferred vendors that we know do a great job, just ask. • We also have wine with your personal label, ask us about it if you are interested. • Please remember, the venue should be left the way you found it, otherwise there may be additional charges. Please see attached PDF for more information.